Belleek 26th annual Christmas ornament is the Kilmalkeder Church bell. This Belleek ornament is the 26th in the annual series, introduced in 2013. 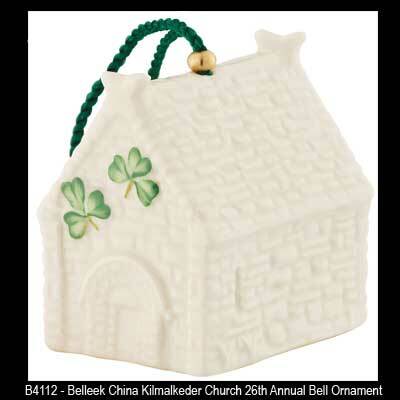 The fine Irish china Kilmalkeder Church ornament from Belleek is the 26th in the series and it is the Belleek 2013 annual Christmas ornament bell. The Kilmalkeder Church ornament is fashioned after its name sake on the Dingle Peninsula in County Kerry, Ireland. The fine china reproduction of this 12th Century church features hand-painted green shamrocks along with an embossed door and roof. The Belleek annual ornament measures 2 1/4" long x 1 3/4" wide x 2" tall and it is hand crafted in Belleek, Ireland. The Belleek Christmas ornament is gift boxed with a shamrock history card that is compliments of The Irish Gift House. Ballintoy Church is the 29th annual Irish Christmas tree ornament from Belleek.